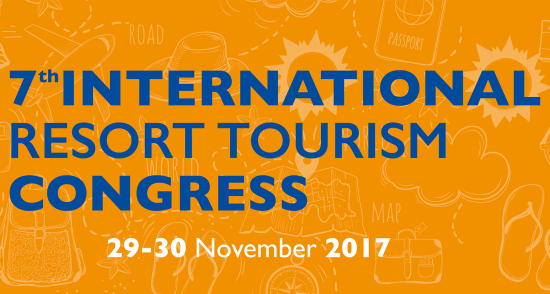 7th International Resort Tourism Congress with main theme “Tourism of the Future, Future of Tourism” will be held in Antalya between 29-30 November 2017. Due to the improvement in Europe and Russia and the situation in the region, tourism gained more importance. Situation in tourism and assumed probable developments in tourism will be discussed in 7th International Resort Tourism Congress. The sector which experienced a hard 2016 entered 2017 with hope. Tourism in 2017-2018 and after and its future will be evaluated by significant actors of Global tourism. Apart from present status of tourism, reflection of short and long term probable developments on the sector will be evaluated in 7thInternational Resort Tourism Congress. Upon the Cocktail Party conducted in Lara Trend Hotel on 29.11.2017, the theme of the congress to be carried out in Antalya Concorde Hotel on 30.11.2017 will be “Tourism of the Future, Future of Tourism”. To this day, very effective names such as; former German Prime Minister Gerhard Schröder, Thomas Cook CEO Peter Fankhauser, TUI Norvegian Cruise Business Development Director Jurgen Stille, Der Touristik CEO Sören Hartmann involved in this event. This year, we are expecting MTS Globe Group CEO Rembert Evling to participate as a spokesman. At the congress conducted by the organisation of Union of Mediterranean Touristic Hoteliers and Operators (AKTOB), not only all the parties of tourism at home and in the world in travel industry but also finance, consulting, investment, operation, management, supplier company and brand’s chief executive officers will participate in the event. 1000 people are expected to participate in the event. Denizbank General Manager Hakan Ateş who will give a presentation about development in global economy and their effect on tourism at the congress will enlighten accommodation sector regarding tourism credits.